1) Can I Customize My Cake? Of Course! Every bride wishes for her cake to be unique! You can make as many changes to the pictured cakes as you want, choose your own colors, piping, and flowers, or send us your own ideas. We can recreate cakes from most photos from books and other websites. 2) Can I Add Fresh Flowers To My Cake? Absolutely! 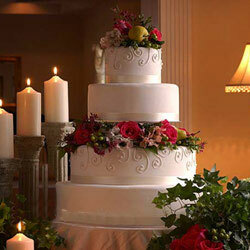 We create exceptional floral designs to compliment your cake and your wedding. When you provide us with your color theme, we will assist you in selecting a beautiful array of flowers. 3) Can I Mix Cake Flavors? We Encourage It! Having trouble deciding or agreeing on the best flavor-assort flavors; add a cheesecake, mousse, or tiramisu. The sky's the limit. 4) When Should I Order My Cake? A minimum of 2 weeks should be allowed for your order. However, we can provide you with a custom cake with a 48 hour notice. 5) Will You Deliver My Cake? We deliver to all locations in the Las Vegas area. 6) When Do I Pay For My Cake? 50% deposit is due at the time of booking. The balance is due two weeks before your wedding date. All major credit cards are accepted. 7) How Can I Order My Cake? Call our toll free number 1-866-284-7465. In Las Vegas call 362-7465. We are available to take your calls Monday through Saturday from 9:00 a.m. to 5:00 p.m.